Ozone and hydrogen peroxide therapies have been around since the early 1900s, and have been used by over fifteen million patients, mostly in Germany, Russia and Cuba. Yet they are little known in the United States, despite their proven safety and effectiveness. Oxygen therapies kill bacteria, fungi and viruses (including herpes and HIV), oxidize cholesterol, deliver life-giving oxygen on a cellular level, and are important immunomodulators. There has been tremendous growth in both research and clinical applications of these therapies in recent years, especially in the fields of joint pain, dentistry and veterinary medicine. This is why they can help the body heal itself of over fifty different diseases, including arteriosclerosis, diabetes, angina, candida, cancer, hepatitis and HIV-related diseases. They may even help heal SARS and bird flu. Yet because ozone and hydrogen peroxide cannot be patented and are relatively cheap to use, they are ignored by the pharmaceutical industry and the medical mainstream. The New Oxygen Prescription is a new updated and revised edition of The Oxygen Prescription published in 2007, which was the third- and vastly expanded- edition of Oxygen Healing Therapies, first published in 1995. I was extremely fortunate receive help from many of the world's leaders in oxidative therapy research, including Dr. Silvia Gra Menéndez of the Ozone Research Center in Cuba, Dr. Renate Viebahn, Dr. Siegfried Schulz and Frank Shallenberger, M.D. Dr. Velio Bocci, the world's leading researcher on medical ozone and author of several ozone textbooks, was kind enough to review every chapter of the book and write the Foreword. I believe that this is one of the most important books I have ever written. In order to create The New Oxygen Prescription, I visited laboratories and clinics in the United States, Germany and Cuba, and interviewed doctors, chemists and patients from Canada, Russia, France and Italy. This book also discusses how these therapies can be maximized through a holistic approach to health that includes body cleansing, exercise, nutrition and herbs. The book contains over a hundred pages of new material, mostly gleaned from peer reviewed medical journals throughout the world. 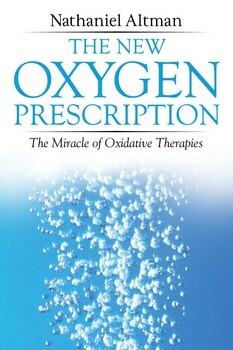 The New Oxygen Prescription: The Miracle of Oxidative Therapies. Healing Arts Press, June 2017. Paper, 512 pages, $19.95. ISBN-13: 978-1-62055-607-8. Also available as an e-book. To order The New Oxygen Prescription, click here.